A belief in the existence of a personal power, influence, or atmosphere, on the part of certain individuals, which enables the possessor to attract, influence, dominate or control others, has been held by the race from the earliest days of written history. Many of the oldest writings of the race contain references to the strange, mysterious power possessed by certain individuals, which enabled them to attract or influence others. And, following the course of written human history along the ages, we may perceive a constant reference to this strange power of the individual, so generally acknowledged and at the same time, so little understood. Coming down to the present age, an age in which great attention has been devoted to the study of psychology and psychic subjects in general, we find that while the old belief in personal magnetism has been strengthened, there exists, at the same time, very little general knowledge among the public regarding the real nature of the force or the best means of using and employing it. But this lack of knowledge just alluded too is confined to the general public. In all ages there have been a few advanced individuals who have thoroughly understood and employed the force of personal influence. Not only have the occult students of the past possessed this knowledge, and have passed it on to their successors, but many of the greatest men of history have acquired a thorough knowledge likewise, and have employed it in advancing their own interests. In some cases, individuals of this last mentioned class have received direct instruction from occult teachers, but in many cases they have stumbled across the existence of the power within themselves, and then advanced in their knowledge of the subject by careful investigation and study, accompanied by constant experimentation. Many of them, in their writings or sayings, have testified to their knowledge and us of this most wonderful power. 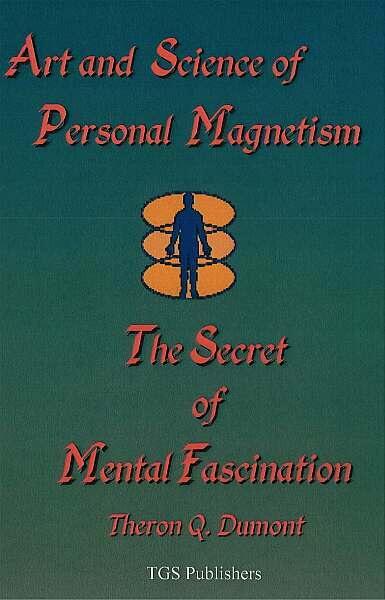 It is difficult even to correctly define the term "personal magnetism," so little are its principles understood by the masses of the people. The dictionaries give us but little help in the matter, so vague are their so-called definitions. Perhaps the best definition is the following: "the strong, peculiar, but little understood power, force, or influence, exerted by certain individuals, in varying degrees, by the means of which other persons are attracted to, controlled by, dominated, or influenced by the individual possessing the power; a form of mental influence exerted by certain individuals over those with whom they come in contact." The principal objection that I, personally, have to the above otherwise fairly good definition, is it implies that only certain individuals possess personal magnetism, the implication being that the remainder of the race are devoid of it. This, in my opinion, is a sad mistake. The truth is, each and every individual is in possession of a certain degree of personal magnetism; that each person may increase the degree and strengthen the power by knowledge and practice.